Our Vic gave trainer David Pipe one of the biggest successes of his fledgling career in the race last year and the David Johnson-owned gelding went on to defeat 2007 totesport Cheltenham Gold Cup winner Kauto Star in the Grade Two totesport Bowl at Aintree the following month. The 11-year-old is one of three entries from Pond House along with last season’s Boylesports.com Gold Cup scorer Tamarinbleu and French import Or Noir De Somoza, who was victorious in Grade One contests over hurdles and fences for Arnuad Chaille-Chaille. Paul Nicholls has an unrivalled record in the Ryanair Chase, having saddled both Thisthatandtother (2005) and Taranis (2007) to victory in the race. The champion trainer looks set to have another strong hand this year with seven entries, headed by last season’s The Irish Independent Arkle Challenge Trophy Chase third Noland, who progressed to take the Grade One John Durkan Memorial Chase at Punchestown in December. The champion trainer has also entered Silverburn, fourth in the RSA Chase at The Festival last year, and Grade One Kerrygold Champion Chase winner Twist Magic. Grade One runner-up Takeroc, Natal, Oslot and last season’s Festival Plate second Gwanako complete the Nicholls-trained septet. Nicky Henderson, the only other trainer to have won the Ryanair Chase (with Fondmort in 2006), could be represented by Golden Flight, successful in the prestigious Grade One Prix La Haye Jousselin in 2005 for former handler Guillame Macaire, and The Queen’s Barbers Shop, who chased home Imperial Commander in the Paddy Power Gold Cup at The Open. The 2007 Seasons Holidays Queen Mother Champion Chase winner Voy Por Ustedes could bid for Festival glory over a longer trip. The eight-year-old won the Grade One Melling Chase at Aintree over two and a half miles at the end of last season and was third behind Kauto Star over three miles in the King George VI Chase on Boxing Day. Alan King is also responsible for the prolific Ouzbeck and the only five-year-old entered, Araldur, who looked a horse with a bright future when getting the better of Free World in the Grade Two Henry VIII Novices’ Chase at Sandown Park in December. The versatile Tidal Bay, victorious in The Irish Independent Arkle Challenge Trophy at last year’s Festival, could return to Cheltenham for the Ryanair Chase. The eight-year-old finished second to Master Minded over two miles in the Seasons Holidays Tingle Creek Chase at Kempton in December and posted a good weight-carrying performance over three miles and a furlong when second in the Rowland Meyrick Chase at Wetherby later the same month. Exotic Dancer may also step back down in distance after gaining a deserved Grade One victory in the Lexus Chase at Leopardstown in December. The Jonjo O’Neill-trained nine-year-old, who was second to Kauto Star in the 2007 totesport Cheltenham Gold Cup, was successful over the Ryanair course and distance in the Boylesports.com Gold Cup in December, 2006. Nicky Richards has entered dual Grade One winner Monet’s Garden. The 11-year-old grey finished fourth in the 2007 Ryanair Chase and proved that he still retained his ability with victory over Betfair Chase winner Snoopy Loopy in the Grade Two totesport.com Peterbrough Chase at Huntingdon in December. Stan began 2009 perfectly when recording a course and distance success in the Grade Three skybet.com Handicap Chase at Cheltenham on January 1 by an impressive 11 lengths and represents the combination of owner Paul Beck and trainer Venetia Williams. A typically strong Irish entry of 13 includes dual Grade One scorer Big Zeb, who beat Thyne Again and J’Y Vole in the Swordlestown Cup Novice Chase at Punchestown in April prior to winning the Paddy Power Dial-A-Bet Chase at Leopardstown on his seasonal bow last month. J’Y Vole’s trainer Willie Mullins could also be represented by last year’s Grand National third Snowy Morning and Grade Two Hilly Way Chase scorer Scotsirish, while Tom Taaffe has entered Slim Pickings, Grade Two winner Glenfinn Captain and Finger Onthe Pulse, who took the Jewson Novices’ Handicap Chase at last season’s Festival. The other Irish-trained entries are last year’s fourth Knight Legend, 2006 Cheltenham Festival winners Newmill and Sky’s The Limit, as well as the Dessie Hughes-trained pair of Schindlers Hunt and Vic Venturi. The sole French-trained entry is the giant seven-year-old novice Original, who made a mockery of his 66/1 starting price when running away with the Grade Two Wayward Lad Novices’ Chase at Kempton Park on December 27 for trainer Marcel Rolland. 1. 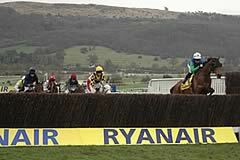 The Ryanair Chase was introduced to The Festival in 2005. It replaced the Cathcart Chase, although the conditions of the race changed slightly with it being open to all horses rather than being restricted to first and second season chasers. 2. The first three renewals were run as Grade Two contests. It becomes a Grade One affair in 2008. 3. The Daily Telegraph backed the inaugural contest, with Irish airline Ryanair taking over the sponsorship for 2006. Michael O’Leary, Ryanair’s chief executive, came close to winning his company’s money last year when owning the runner-up Mossbank. 4. 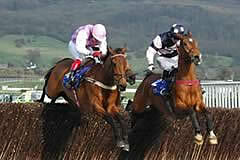 Fondmort, the 100/30 joint-favourite, was landing his fourth race at Cheltenham when victorious in 2006. Our Vic, successful last year, was winning for the third time at the course and has a further four Cheltenham placed efforts to his name, including when runner-up in the 2007 Ryanair Chase.